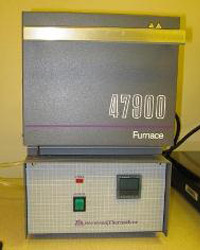 The thermolyne benchtop muffle furnace is set up to flow nitrogen for annealing in a nitrogen environment. Maximum temperature is 1000oC. Ramp time is slow (10 mins. up, 1 hour down). Maximum sample size is a 4" wafer. This tool does not require a formal checkout. Use the tool with another user to become familiar with operation before you use it yourself.